Private South Carolina tours certainly have everything you could possibly hope for from history and culture to wild adventure. While the city of Columbia is the capital of the state, it is historic Charleston that stands out above most other cities in this state. Enjoy the long stretches of beautiful coast for which the state of South Carolina is well known for. 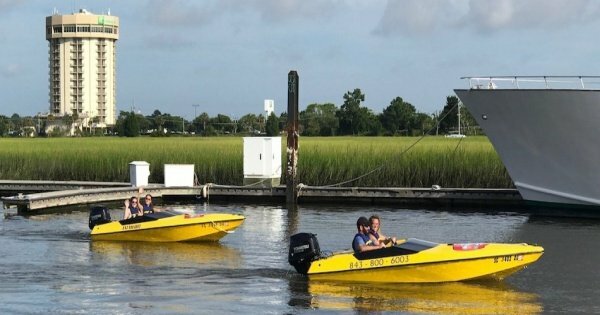 Here you can enjoy great South Carolina boat tours which include speedboat tours and many other activities related to water. A visit to Myrtle Beach is a must when you are in South Carolina with its miles of pristine sandy coast. When you take any of the South Carolina historical Tours found in Charleston, you will be both astounded and charmed. This wonderful city has Grand house, charming and delightful streets, plantations and architecturally amazing churches. You really feel you have wandered into yesteryear. Other excellent places to visit in South Carolina are the Plantations, Riverbank Zoo and Garden in Columbia, Huntington Beach State Park, Hilton Head Island and so very much more! After a day of adventure tours South Carolina provides excellent nightlife too. Amazing food, with South Carolina specialities, in great restaurants, excellent entertainment in the bars, clubs and music venues. Every season has something for tourists to do and see in South Carolina. During the summer, the warm weather is great for beach activities. In the Fall, temperatures are milder and you can see the colours of nature change on hiking tours. Winter is when you beat the crowds but still enjoy the sights with many places open all year round. Spring is ideal for the many adventure tours South Carolina offers. When you visit South Carolina, you will be visiting a state in the United States that is cheaper than the average. There are cities which are expensive but generally you can get great value when you come here especially when going on private South Carolina tours. The amount of money you spend will depend entirely on the time of year you go, which city you are visiting and the activities you want to do. When heading to areas in South Carolina during the summer months, it is advisable to book well in advance of going. You can get deals on accommodation and look out for the discount deals on private South Carolina tours. South Carolina is a safe place to visit however you still need to be careful. Don’t walk alone at night in areas unknown to you and always be of your surroundings. South Carolina has above average rainfall in the United States with 47 inches per year when the average is only 39 inches. There is not as much snowfall. This state has 216 sunny days on average. July is the hottest month with averages temperatures of 33ºC and January is nearly always the coldest month with temperatures averaging 0ºC. The temperatures in early Fall and late Spring are ideal for hiking tour South Carolina. Experience the adventure of a lifetime on our Speed Boat Adventure Tour. A guided and narrated Charleston Harbor tour with a twist.